My name is Tom Ryder. I am a wedding singer providing live music on acoustic guitar and vocals, covering London and the south east of the UK. I also travel further afield when requested. I can sing during any part of your wedding, including the ceremony, drink receptions, meal (wedding breakfast) and the first dance. London is not just the capital of the UK, it is one of the greatest cities in the world, and a fantastic place to get married among the historic architecture. The city is steeped in history and has some of the most historic buildings in the world. Many of these, whether in north London, east London, south London, west London or central London, have been converted to host weddings. Access can be tricky in London, and driving is not always possible due to a lack of parking. However, if music equipment is available at the venue or provided by your DJ, we will still be able to find a solution for live entertainment with acoustic guitar. I have performed at weddings all over London, including Finsbury Town Hall, Kew Gardens, Chandos House and exclusive members clubs. I can take requests from guests and offer stripped back acoustic versions on the guitar of your favourite tracks. 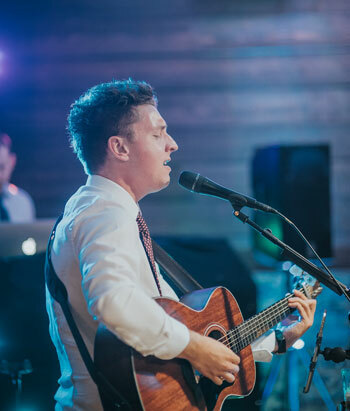 For the majority of wedding couples, music is an integral part of their special day, and live music has that extra sprinkle of magic about it. Although there are a number of live music options available at a wedding, an acoustic guitarist and singer is a great solution. The guitar is a very versatile instrument, and while it is common in pop music, it is also possible to rework and strip back dance and house classics and adapt them for acoustic guitar and voice. Is your wedding in London? Are you looking for a singer? Contact me here for advice about live music on your big day. You can view the services I provide, compare prices, view my repertoire, and read what other couples have said about me by reading reviews and testimonials.